[February 23, 2017] – Today, as Illinois Members of Congress are back in their districts, Protect Our Care Illinois, a statewide coalition of consumer health advocates and providers, call on elected officials to stop the dangerous path towards repealing the Affordable Care Act (ACA) and dismantling Medicaid with no viable replacement. 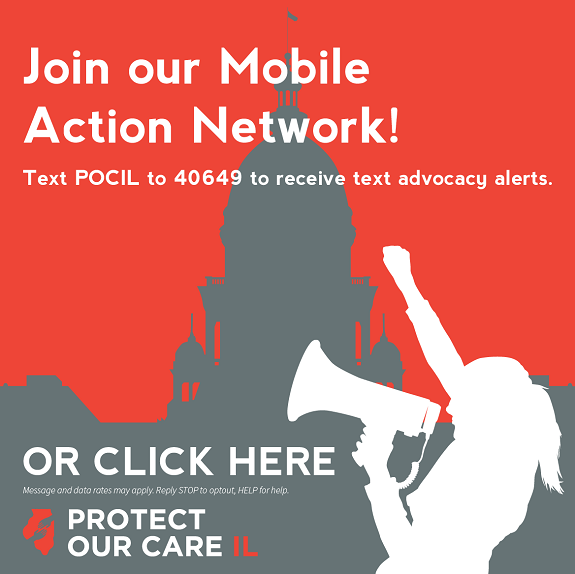 The Protect Our Care Illinois Coalition, which launched its official online presence today, currently has over 50 members including lead agencies Access Living, ACLU of Illinois, AIDS Foundation of Chicago, Chicago Coalition for the Homeless, EverThrive Illinois, Health & Medicine Policy Research Group, Heartland Alliance, Illinois Coalition of Immigrant and Refugee Rights, Legal Council for Health Justice, SEIU Healthcare Illinois Indiana, the Sargent Shriver National Center on Poverty Law and Thresholds. Despite public disapproval, congressional Republicans are rushing down a chaotic path that could take health coverage away from 30 million people – including 1.2 million Illinoisans — and raise premiums for millions more. “Repealing the ACA will not protect our care,” said John Peller, Protect Our Care Illinois Coalition member and President/CEO of the AIDS Foundation of Chicago. “Instead it will diminish coverage for millions of people in Illinois and threaten the local economy.” As Illinois grapples with an unprecedented budget crisis, repealing the ACA will result in a loss of 114,000 jobs in our state, a loss of $113.8 billion in business output between 2019 and 2023, and a loss of $2.0 billion in state and local taxes. Jobs loss would be felt across the economy and especially in rural areas, with 39,000 lost jobs in health care and 75,000 in other sectors during the first year of repeal. The Congressional Republican plans for replacements and “repairs” don’t add up. Every ACA “replacement” or “repair” proposal covers fewer services, for fewer people, at higher costs to the consumer. For example, the recent proposal from Congressional Republicans offers tax credits based on age and not income. As a result, a 50-yr. old millionaire would receive the same tax credit as a 50-year-old low-wage worker. Health Savings Accounts (HSAs) are another common element of Republican proposals. HSAs impose higher out-of-pocket costs and little help for moderate to low income families; instead HSAs merely allow wealthier people to shelter more of their income from taxation. High risk pools won’t help either: prior to the ACA, high risk pools cost Ilinoisans with pre-existing conditions 150% more in premiums for plans with inadequate coverage and dangerous lifetime limits. These have all been tried before – they don’t work. Adults and children will lose protections against annual and lifetime limits. I am a self-employed 63-year-old woman. I have “pre-existing conditions” and a chronic illness. Before the ACA, the only insurance available to me was very expensive catastrophic-type health insurance with extremely poor coverage and a sky-high deductible. Thanks to the ACA, not only can I get decent health insurance, but the ACA guarantees that basic health encounters such as wellness visits, mammograms, etc. are available to me at no cost. Thanks to the ACA, I was finally able to see a specialist and receive proper diagnosis and treatment for the conditions that are causing my chronic pain. I have no idea what I will do without the ACA. While I was in college, I was able to remain on my parent’s health insurance so that I could focus on school rather than a career path and college at the same time. I have a congenital birth defect as well, which without coverage, I would be hundreds of thousands of dollars in debt. Repealing the ACA without anything to help people with disabilities means that those of us suffering with preexisting conditions could die, or be forced into major debt. I was blessed to not have a lapse in coverage because my COBRA ran out in December 2013. I have a pre-existing condition and would be unable to work without medication and regular doctor visits. I have also had several hospital stays and emergency room visits since January 2014, which my insurance paid most of. The ACA is the reason I can work without trying to find a full time job with benefits. Without the tax credits to help pay premiums and coverage for my pre-existing condition I would once again be unable to get health insurance.